Fungi are the second largest kingdom of life but most are microorganisms invisible to the human eye. Indoor moulds concern the medical profession and general public and there is a serious need to develop an authoritative, reliable and complete identification system. Our work profiles the indoor fungal biodiversity (mycota) to a much greater depth than has been previously attempted. Our goal is to bridge the knowledge gap between uncultured and cultured fungi in indoor environments and provide authoritative taxonomic and molecular data for metagenomic studies of fungi. This project will continue the analysis of fungi isolated from our global house dust sampling by dilution to extinction methods (Fig. 1), supplemented with additional intensive classical isolation from European and US buildings, and in vitro testing of new barcode markers that should allow more precise identification of indoor molds. Fig. 1. Modification of the dilution to extinction method to use microtubes arranged in 96-well format. A vast increase in indoor fungal species diversity on the global scale. Confirmed significance of the xerophilic genus Wallemia (a phylogenetically isolated Basidiomycete lineage, Fig. 2). Fig. 2. 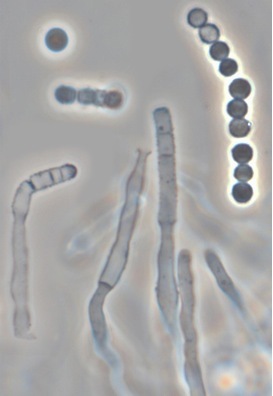 Microscopic structures (conidiogenous cells and conidia) of the common indoor mould Wallemia sebi.. Enhanced identification database for indoor molds; more species; more barcode genes; enhanced visual information added to database. Continued taxonomic and phylogenetic studies of cultured fungi from classical and dilution-to-extinction techniques, and comparison with fungi detected by pyrosequencing; recognition and description of new species. 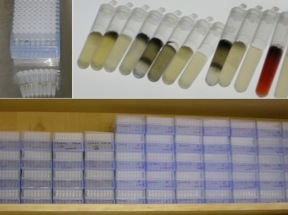 Testing of genes mined from fungal genomes for utility as DNA barcodes for indoor fungi. Testing of PCR primers for new barcode genes using indoor fungi as a model because of their broad taxonomic diversity; coordination of international round robin studies with promising markers. Isolation of new fungal strains from samples obtained from around the world, with an emphasis on the United States; modification of dilution-to-extinction techniques to increase efficiency.